About a month ago, while helping my father launch his sailboat at Bronte Outer Harbour in Oakville, I had an opportunity to meet Steve Inniss from Saved By Bikes. 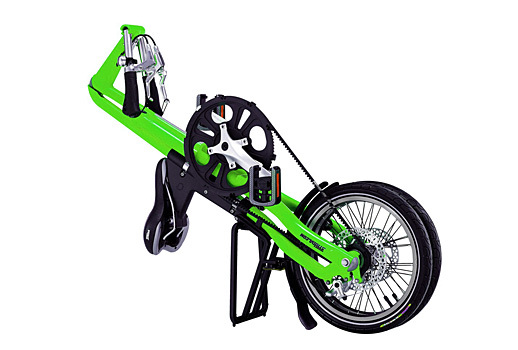 I had bee in contact with Steve to get more information on a really unique folding bike called a Strida. Steve was excellent enough to suggest he would come down to the marina and demonstrate the bikes to myself, Sarah, and my father. We met, and he explained how the bike folded, how and why it had been developed (for commuters in London who need to be able to take a bike on the Tube), and gave us a general rundown on materials, workmanship, and the like. He explained the unique greaseless belt drive, then let us take his demonstrator models for a spin. Suffice it to say we were all smiling. I was very interested in the bike, as were both my father and Sarah. Cycling in an upright position as one does on a Strida is much different than the fast-forward racing position I had spent most of my life in while riding, and Sarah found it very comfortable as well. The only thing I didn’t like about the bike was the price. At around $900, it’s a pretty expensive bike. Not that it isn’t worth it. A high-quality aluminum folding bike that only weighs 22lbs is going to be pricey. Add in the disc brakes, the very amazing belt drive, and the fact that it’s not a very mass produced product, and the price does make sense. I just couldn’t afford it. Weeks went by, and I saw a Strida for sale on craigslist. I got in touch with the seller, and she informed me that the bike had been won in a contest, and never ridden. 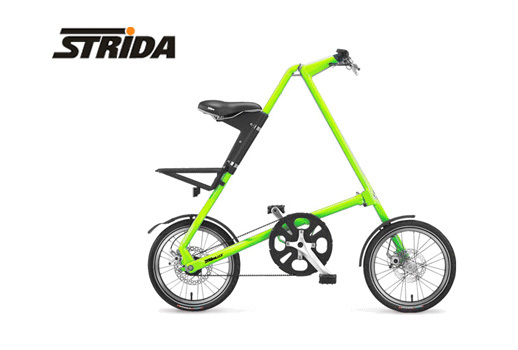 We arranged for me to take a look at the bike, and after invoking the 24-hour rule (Sarah and I use a 24-hour rule to avoid impulse purchasing), I was the proud owner of the most glaringly fluorescent green Strida that’s ever been seen on Toronto streets. Even more proud because I had bought it with a 45% discount. I’ve got about 150km on the bike since I bought it, and I am loving it. We used to have a really great bike storage option here at my office, but the new owner of the building has unfortunately removed it, meaning the only place to lock up our bikes is outside on the scarce bike racks outside the building. Several people have had bikes stolen from there, so I am reluctant to bring my Gary Fisher to work. I’d be traumatized to have that stolen. The Strida has been a perfect solution, since i can fold it up (in about 10 seconds!) and bring it up to my office. Back to commuting by bike, which is far more pleasant than the TTC. I like my bike too.